MASKerade: CC90 - The Perfect Reason....for a Giveaway! CC90 - The Perfect Reason....for a Giveaway! Today, I have a GIVEAWAY! 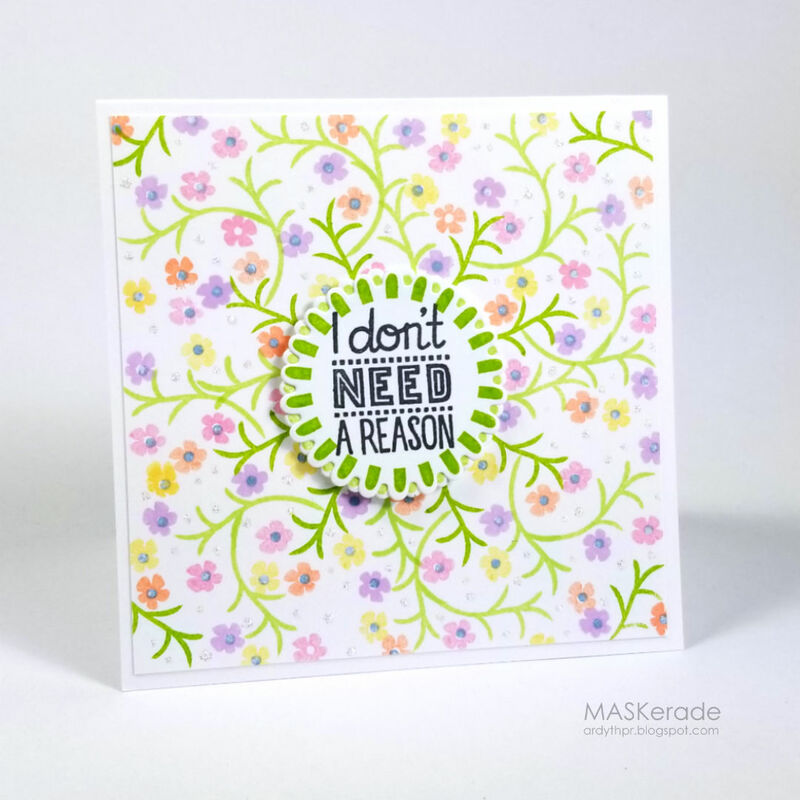 And "I don't need a reason", but if you comment here, you can win The Perfect Reason stamp set and matching dies from Catherine Pooler Designs! Comment below before 8 am Monday, April 9 **EXTENDED to 8 am Thursday, April 12! ** and one commenter will be picked randomly (US only). This floral-builder set has fun sentiments and endless possibilities! I used my MISTI-only wreath-building technique to create this pretty spring card. I started with the branch stamp and built a basic wreath in Garden Party and Lime Rickey. Then I added some tiny flowers using It's a Girl, Sweet Sixteen, Bellini and Tiara. The flowers were added randomly, and once they were done, I used an acrylic block to add more branches, then more flowers. My sentiment uses the die for the large flower. I stamped one in Lime Rickey, one with Garden Party and then layered them, with their petals offset, so that you can see both shades of green. It's a fun and easy way to get a different look with this die! My team-mate Ashlea is also giving away The Perfect Reason bundle, so click here and comment for another chance to win! I was inspired by the pastel colours in a circle. Such a pretty wreath, Ardyth! Love the colors and how you achieved the wreath look and the random stamping. So well done! Makes me smile. Have a great day! I just recently discovered Catherine Pooler and love her stamp designs. You card is lovely — the vines fill in so nicely and the colors are so springy (still heaps of snow here in MN...) Thanks for sharing it! Gosh, I love how you made this wreath. Great technique. I’m going to have to give it a try. Love it. Thanks for sharing. This is such a beautiful card, Ardyth. The colors are so vibrant. I love the design. Love the card you made with this set! Looks store bought! Its such a beautiful card. I'm hooked onto your videos. You make everything look so simple. Well, in this card, The flowers in Stone Blue have taken my heart. Its beyond pretty. Now my search is on for Catherine Pooler Stamp Pads in India. Thank you so much for sharing your ideas. Hugs. Such a pretty card! Your background is terrific! so spring-y and fun! tfs! What a pretty card! So ready for spring! Thanks for the chance to win! Sure feels like Spring! So bright and cheerful! The colors are stunning! Your card is so pretty! Love the way you made the wreath! Thanks for sharing and giving us s chance to win! I sure hope spring weather is right around the corner! Have a great day! What a great giveaway - just because! Love it! Flower builder sets always look great when cardmakers show how to use them. Would love to try one! Love your cards, they are always an inspiration. I have learned so much just from seeing you take a designer's card and explain the elements you are focusing on. Happy day to you! Fabulous card... love your videos... thanks for sharing your talent! This card is wonderful! Thanks for sharing the video. Really appreciate your video showing the mini MISTI technique to create a wreath card, Ardyth! Thanks so much for offering a giveaway, especially for a stamp set that makes such a pretty card! This is fabulous! And you just reminded me that I need more cp inks! Lol. lots of possibilities with this set! Love these fab florals on your card. Thanks for the opportunity. Gorgeous card! I love the design and the beautiful spring colors! Awesome idea of using the mini MISTI and turning the paper for this wreath building technique! Gotta try that! This is gorgeous! I love how you used the stamps to make the wreath. So fun!! Wow!! That is BEAUTIFUL!! And I love the video...so simple and quick! Ever so pretty - love your soft colours. What a stunning card. I love the colors, patterns, and design. Just lovely. Very clever and beautiful design, Ardyth! Lovely spring colors, too! As a previous winner, please exclude my name from the drawing :) I LOVE Catherine's ink pads...Thank you! Beautiful background Ardyth. So springy and light. Perfectly Pastel! LOVELY card design...I admire your creativity and patience in stamping all of the wreath vines and flowers. So pretty. I like how fresh it looks--very springy. Nice color scheme, too. Great card Ardyth! That colour pallet and those flowers reminded me of the wallpaper in my bedroom when I was a kid. Funny how a card can bring back memories! Such a great way to make the wreath! Beautiful result! Thanks for showing us how! Beautiful card love the layout. Love your products - especially your inks! Beautiful!!! What a great stamp set! Love this stamp set and CP inks are the greatest!! Such a pretty card. I love the colors, reminds me of spring which has refused to come to New England yet. Thanks for sharing. Loving what you did with this set! Beautiful! Reminds me of a handmade quilt. This is such a beautiful card, Ardyth! I love your videos!! I love love love this card! I love the pastel colors you chose. What a great set of stamps and dies. Absolutely beautiful card! I love the little flowers all over the card! You are very talented! I love how you used the branch like turn around stamp. Makes me think I should look at my stamps to see if I can do this too. By the way, I love your cards. You made the wreath look so easy! Thanks. Ardyth- your card is beautiful! I love the springy wreath! We are in need of spring here in cold Vermont! Your videos are so great - just a quick tip with lots of action. This card is so dear - love the wreath-builikndg idea. Thanks for all the inspiration! I really like this set. The way you created this beatiful card is so neat. Love your videos. My eye immediately spotted the little branches surrounding the circle -- made the layout special. You do inventive CAS cards. What a great set this is, and I love how you used it to create such a lovely card! Love your card,Ardyth! Quite creative! What looked like a very fussy stamping became easy and sweet! Genius! Can’t wait to give this technique a try. Thank you! Very pretty design and colors. Yes, I see that we Canadians are excluded from the giveaway, but I'm commenting anyway. :D I'm commenting because I am blown away by how perfect your floral background is, it's just gorgeous! Your background stamping is spring perfect! What a pretty card design. Loved your video as always! Wish it was a tad slower as my mind doesn’t always work at warp speed.😃 since I was planning on getting the set of pastel ink pads that you featured, hope I can be lucky enough to win. Even if I don’t, the technique can be used with other small flower stamps and I can draw or carve a small branch. Wow! Makes me want to run buy that set. I already own all the inks and refills and couldn't live without them now. What a pretty stamped background. I love how you used the small images and flowers from this set because I always have trouble figuring out how to use them. This is nice and cheerful for spring. What a gorgeous spring-time card! Love the pretty wreath your created! Great video. Thanks for sharing how you created that spectacular card front. Thanks for the chance to win. This is such a delicate and feminine card. It also sings SPRING! The colors are so relaxing as well. Very pretty card! I really like how you created the background. I love how you put everything together. It's an eye catching design. The background flowers are beautiful! Such a lovely pop of color. 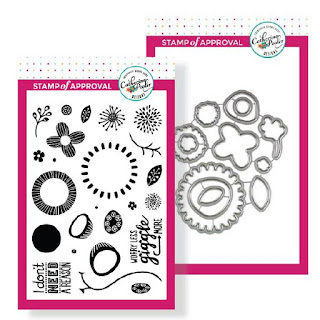 I really like this stamp set, and am grateful for the opportunity to win it with this giveaway. There are so many ways that a card could be made with these stamps; which makes my head spin with the possibilities. Thank you. This is so beautiful Ardyth and what a fantastic stamp set. I love sets that have lots of little elements to create cards like this. And how generous to have a giveaway, would love to win!!! So excited to be a part of your giveaway! I am inspired by your design. Oh Ardyth... your card is so very lovely and beautiful! Love the colorful flower on the background. Thank you for the inspiration and a chance to enter your giveaway! I am so ready for spring. 70 degrees one day and snow the next! Beautiful stamp and die set. I love the delicateness of this card. Such a pretty card - love the floral background. Beautiful card and great video. Quick and easy! What a lovely idea to use the set for a background. I love it. Thanks for sharing. Love your card! Pretty colors. Makes me smile to see beautiful colors at this time of year. Thanks for sharing and have a great week. Beautiful, soft background. I love the colors. EVERYTHING about this card is just perfect! It's one of the prettiest cards I've EVER seen!! The background is beautiful! Very pretty card. Oh My - - what patience you have to stamp that background. Its all those little itty bitty leave and flower stamps. Really nice! Love the soft muted colors you used. Oh the lime Rickey ink is splendid! What a yummy color! And your card is just gorgeous and beautifully creative - so lovely and serene! I love the background paper you created. Very pretty card! What a fun and beautiful card!!! I love it!!! The colors are gorgeous and I love how you mixed the different shades of green for the branches. Perfect!!! Thanks for sharing and the giveaway!!! I just love all the florals in the background but I might have to try it on a 3x3 card because I probably don't have your patience!! I absolutely love your card! The colors are so soft and subtle and yet very elegant! Great design work! Such a pretty card. I like the vines all over the card and such pretty colors! Thanks for sharing the video, it helps so much watching someone make such a wonderful, pretty card. Thank you for sharing. The colors are so bright, perfect for spring (since it feels and looks a lot like winter still). I love this set, very versatile! I haven't used it in a while, but it sure looks like I need to bring it out again! I love everything about this sweet card! The stamped wreath, the floral background, and the pretty colors! Each card maker used these stamps in such different ways and this is one of my favorites. The stamped background is lovely, and you were so creative with your wreath and sentiment. What a beautiful card!! Totally in love with this!! I love the graphic look these flowers have. They're so bold and playful! Thank you for the video, this is such a sweet spring card. I love the colors and arrangement! I love your card! Your card is so dainty and sweet looking! These stamps are so cute and versatile. This set is a true staple stamp set to have. I make cards with the ladies at an assisted living home and they just love to use flowers! Thank you so much for the video showing how to make your super cute card! A really clever use of this awesome stamp set! Love the look of spring this design has. Thanks for the video! So soft and pretty, Ardyth, and just perfect for spring. Awesome card. Love the soft colors. Beautiful card, absolutely love it! I'm so ready for spring! Who needs a wreath builder when we have Ardyth’s blog?! 😁 So clever you are! The spring colors used in the Card will hopefully bring spring our way...it’s been a long winter. I just discovered you today, and am now a follower on Instagram. Your cards are beautiful!! Sure wish Copic markers weren't so scarce. I'd love to get a few more and really start practicing with them. Beautiful card Ardyth! Thanks so much for joining us at The Card Concept. Saw this at TCC and came over for a closer look. Lovely stamping, Ardyth. Extremely pretty card. WOWSA! What a stunner! So glad you shared it here at the Card Concept!